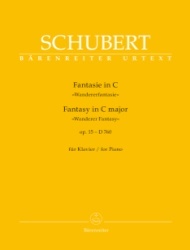 The "Wanderer Fantasy" is Schubert's most popular Fantasy. While Schubert was playing the Wanderer Fantasy for a circle of friends, he faltered and exclaimed impatiently: The Devil should play this stuff!” Yet it wasn’t the Devil but Liszt - like Schumann a great admirer of the piece - who later arranged the “Wanderer Fantasy” for piano and orchestra and again for two pianos. It was also Liszt who gave the work the nickname it has retained to the present day.